These are common items at events – but whether you’re at home, work, school, or an event – the same rules apply. Which of these items go in the recycling, composting, or trash bin? Are you a whiz of the backyard compost pile? Do your friends call you with their composting questions? We’re about to find out what kind of composter you really are. This quiz will challenge your mastery of the compost pile! Quick: How many types of plastic are there? Sorry! You’re (probably) wrong. The answer is, not even Professor Plastics knows that answer! What’s more, not all plastics are created equal. Some can be recycled. Others belong in the trash. Do you know what to do with the common plastic items in this quiz when they reach the end of their lifespan? 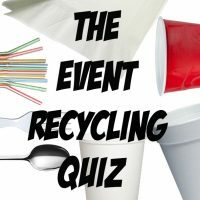 Quiz: What’s Your Recycle IQ? Take this 10-question quiz to see how much you know about what is recyclable in Chittenden County, VT (and what isn’t!). From plastic bags to bottle caps to Styrofoam and more, test your Recycle IQ and see how you stack up! Quiz: What’s Your Composting IQ?